About 8 o'clock this morning I walked the dogs up the ridge behind the house and thought I smelled smoke, but I could not see smoke. Just as a test, I said nothing to see if She of the Sensitive Nose would smell it. Nope. This afternoon, my friend Paul called to say that his wife had spotted smoke to the south of their house and could I see it? In fact, I could, once I walked uphill a little. Checked the Pueblo weather radar, and there was definitely a fan-shaped echo to the southwest. And we were smelling smoke for certain this time. 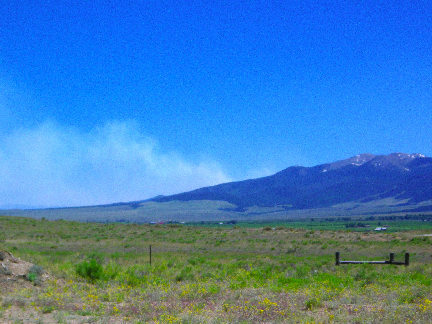 By 5 o'clock in the evening smoke was definitely moving into our valley—apparently a small fire at the Great Sand Dunes National Park doubled in size today and is sending a smoke plume eastward. That is miles and miles away from here, but the smoke is dropping down as the evening air cools. They are calling it the Medano Fire, from the creek running past the dunes. And as a commenter on the linked site points out, that is pronounced in local English as "MAD-naw." Really. It's Spanish from an Old Castillian word for mountain, and in Spanish there is an accent mark on the E. Not Med-AH-no, which some people say in the mistaken belief that they are pronouncing a Spanish word correctly. "Why can't we enjoy summer?" M. asked rhetorically when she smelled smoke. And, adding the catchphrase of the season, "I want my life back." UPDATE: It's mentioned on Wildfire Today as well. The Medano fire in Great Sand Dunes National Park, about 70 miles southwest of Pueblo, Colorado (map) has not been doing much… until today. Lightning started the fire on June 6 and yesterday it was about 373 acres, but by Thursday evening it had burned about 3,000 acres, according to park spokeswoman Carol Sperling. The National Park Service is not putting it out, but is allowing it to benefit the natural resources. Hurray for the National Parks guy who said, "Let it burn." We need more people like that who understand that sometimes, forest fires need to happen.